Microsoft needed to bring its flagship product up to date in a radical new way, and in Windows 8, it has finally combined the power of the PC with the flexibility of the tablet. Windows 7 in many ways represented the pinnacle of a tried-and-trusted software environment. Its roots could be traced right the way back to Windows 95, if not beyond, but while Microsoft had polished and refined the basic underpinnings to excellent effect, Windows 7 was ultimately another evolutionary step. With Windows 8, the software giant is taking a much-needed risk. Windows 7 may continue to feel rock solid - and we suspect many will cling to its familiar reliability - but it's also beginning to show its age. The touchscreen experience is practically nonexistent, music and video content is served primarily by third parties, the game selection is drying up, and there's no central app store. 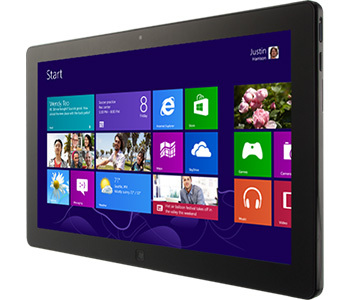 This is an operating system that includes a stylish touchscreen interface, as well as a powerful desktop. That's an awesome set of ingredients, but there's no denying that both environments are vying for attention, and Microsoft's biggest failing is that it hasn't successfully educated users on how to make the most of the two facets of Windows 8. On a desktop, the Modern UI is often little more than an obstruction that has to be moved aside in order to get to where you want to be; Microsoft's challenge is to make the Modern UI more relevant to power users who typically multi-task with various windows across numerous displays. Anyone in the market for a touch-capable PC should consider Windows 8, it's a no-brainer. But for the desktop user, there aren't a great number of compelling reasons to upgrade. Sure, the improvements are there - Windows 8 is more secure, faster and topped-up with new features - but if you spend most of your time on the desktop, there's no obvious reason to move away from the still-excellent Windows 7. All said and done, Windows 8 delivers two very good computing environments, but we would have preferred a single great one. The Microsoft Windows 8 operating system is available to purchase from Scan Computers*. Not defending Apple here as I am not big fan of their politics but tablet OS on Apple devices looks, feels and is tablet OS. Desktop OS is once again - desktop OS. While I like that Windows uses basically same core and can run nearly identical software (except on RT one that is) - there is no differentiation between the two. Why would I need touch-screen Modern/Metro/Annoying GUI as default (and without official possibility to default to Desktop only) when I don't have a touch-screen? And why would I need a touch-screen on desktop PC in first place when I am more than 1m away in first place. I am 6'2 but still my arms are not that freaking long and it's not comfy at all. So.. I think it is very capable OS its just that it was ruined by it's inability to default to Desktop (I can live without start menu, never mind that one, we have keyboard shortcuts for Run etc.). I don't want an OS that everyday screams at me - look, I have touch-screen functionality but you don't have one! In your face! No thanks. Hope next version of Windows will be actually smarter not just “smarter”.